The great Egyptologist Jaroslav ÄŒernÃ½ referred to the Topographical Bibliography as the Â‘Scotland Yard of EgyptologyÂ’, where the skills of detective work were used to track down monuments and publications. The Griffith Institute is housed in the Griffith Wing of the Sackler Library and is part of the Faculty of Oriental Studies, University of Oxford. The Institute's unique combination of projects contributes to research and teaching at the highest level. The Topographical Bibliography of Ancient Egyptian Hieroglyphic Texts, Statues, Reliefs and Paintings, (also known as Porter & Moss) is an essential and comprehensive reference resource for Egyptologists, presenting and analysing both published and unpublished information about ancient Egyptian monuments. The first seven volumes are arranged topographically and cover the whole of Egypt and areas beyond, including Nubia (southernmost modern Egypt and northern Sudan). 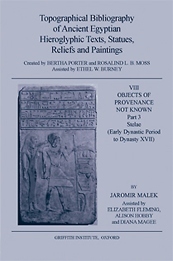 Volume VIII addresses the significant body of material in museums and private collections which has no provenance. A digitised version of this data is under development and will follow shortly. The concept of a bibliography of Egyptian monuments arranged topographically was first proposed by the scholar and lexicographer Adolf Erman in the late 1890s, as a part of the scheme for the Berlin WÃ¶rterbuch. 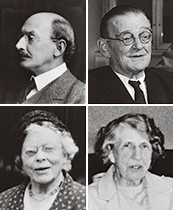 It was Francis Llewellyn Griffith, the first Professor of Egyptology at Oxford, who made the idea a reality by providing financial support and the resources of his private library. Miss Bertha Porter, a professional bibliographer, was employed by Griffith to analyse publications. After 20 years of collecting references an additional editor was sought. Miss Rosalind Moss, a student of Griffith's, gave the Bibliography the structure that we are familiar with today. The later editorial partnership of Dr Moss and Mrs Burney has passed into Egyptological folklore; they are affectionately referred to as the 'Two Ladies', in reference to the ancient Egyptian goddesses of Upper and Lower Egypt. In 1971 the formidable task of Editor fell to Dr Jaromir Malek who has successfully launched the project into the digital age. Material for the Bibliography is gathered from an ever-expanding range of multi-lingual sources, encompassing both specialist and semi-popular Egyptological and Near Eastern publications, periodicals, museum guides, exhibition and auction catalogues, together with the growing wealth of web resources. The Bibliography also analyses a range of unpublished manuscripts, including those housed in the Griffith Institute Archive. The Bibliography volumes are constantly revised and augmented. In addition to the published volumes, a vast amount of material collected for incorporation in future revisions is available for consultation by scholars. Approximately one million references are stored on handwritten 'Appendix slips', waiting to be digitized and edited for the new version of the project.